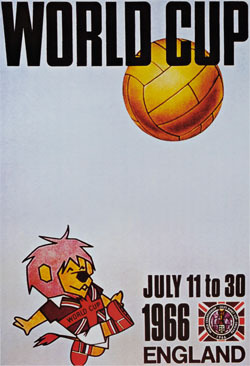 The eighth World Cup was played in England 11-30 July in 1966. The qualifications for the final tournament included 70 national teams (Africa was boycotting the tournament due to a new rule that forced the winners from the continent to partake in a play-off against Asian teams). Of these, 14 teams succeed to qualify for the final phase of the World Cup along with the automatically qualified host nation England and the reigning champions Brazil. In 1960, it was decided that the country there association football once had been born finally would be the host for the biggest tournament in the game. The Third World on the other hand was still not considered worthy to earn full membership in the greatest sport on earth. An increased amount of African nations had become members of FIFA, but neither this time was the Confederation of African Football permitted a guaranteed place in the final tournament. Upset by the treatment, all African teams would react with a complete boycott. This lead to a diminished qualification in the Africa, Asia and Oceania zone, including only two teams: Australia and North Korea. The latter would advance to the final phase for the first time. The colored pictures that have been spread from the 1966 World Cup in England (you can see some below), has been added with color afterwards; the television audience in 1966 had to follow the games in black and white. But they could on the other hand for the first time see slow-motion replays from matches that were broadcast live. Another novelty was drug tests that for the first time were put into practice by FIFA in a World Cup. The format was the same as the previous World Cup with a group phase (every group included four teams) which preceded a knock-out phase with eight teams. Arenas in seven towns including two located in London was used for the tournament. 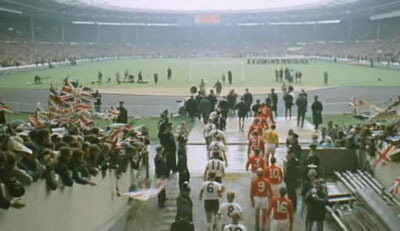 The final was played at Wembley Stadium that at this time had a capacity of almost 100,000. The average attendance (48,847) in the whole tournament would beat the old record (47,511) from the 1950 World Cup. England didn't look like a prospective championship in the first match against Uruguay (the first ever World Cup match played in floodlights). Despite the bleak impression given in the premiere and some mixed performance as the tournament progress, the home nation made the dream come true by winning their first World Cup title. Among the big names in the English side were Gordon Banks, Bobby Charlton and Geoff Hurst. In the final England defeated West Germany after extra time in a monumental game. One of the most debated goals in World Cup history occurred after a shot by Geoff Hurst hit the crossbar and bounced down near the goal line. It was decided as over the goal line by the referee, but a debate would go on for decades afterwards if the ball was over the goal line or not. An extensive report by Ian Reid and Andrew Zisserman later claimed with the help of modern technology that the ball never was over the line. Players walking out for the final. The biggest performer in the tournament, however, was arguably the Portuguese player Eusébio. Portugal came third after losing against England in semi-final and defeating Soviet Union in the third-place match. Just as in the previous World Cup would some matches display a great deal of unsportsmanship. Uruguay against West Germany became a scandalous match in which a Uruguayan player disputed with the police after being sent off. Brazil that had won the latest two championships gave a bleak performance and was out already in the group phase with Pelé half injured. The fact that the opponent players could neutralize the skills of Pelé with unjust tackles was a shame (and for Pelé itself it was reason enough for retired from international football, until he changed his mind two years later). Italy did an even bigger fiasco than Brazil, which was definite after a humiliating loss against North Korea. This was their last match in the group and lead to a missed advancement. North Korea would be close to follow-up with another sensation when taking a lead with three goals to nothing against Portugal in the quarter-finals. Their Portuguese opponents would, however, restore the order in the world of football by five consecutive goals. FIFA World Cup 1966 would include 32 matches in which 89 goals were made (2,78 goals per match), numbers that peculiar enough were identical with the previous tournament. Five players were sent off during the tournament. England, Argentina, Portugal, North Korea, West Germany, Uruguay, Soviet Union and Hungary would make it through the group phase and on to the knockout stage. In the Quarter-finals England, Portugal, West Germany and Soviet Union won their matches. And in the Semi-finals England and West Germany won. In the final England would beat West Germany in a dramatic and unforgettable match that needed extra time to separate the sides. Geoff Hurst did three of his teams four goals and became the first player scoring three times in a World Cup final. 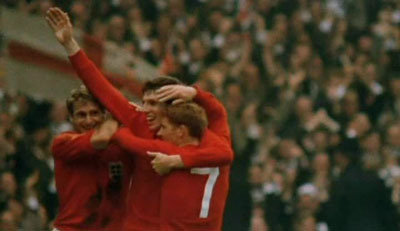 The England team celebrates after a goal in the final.